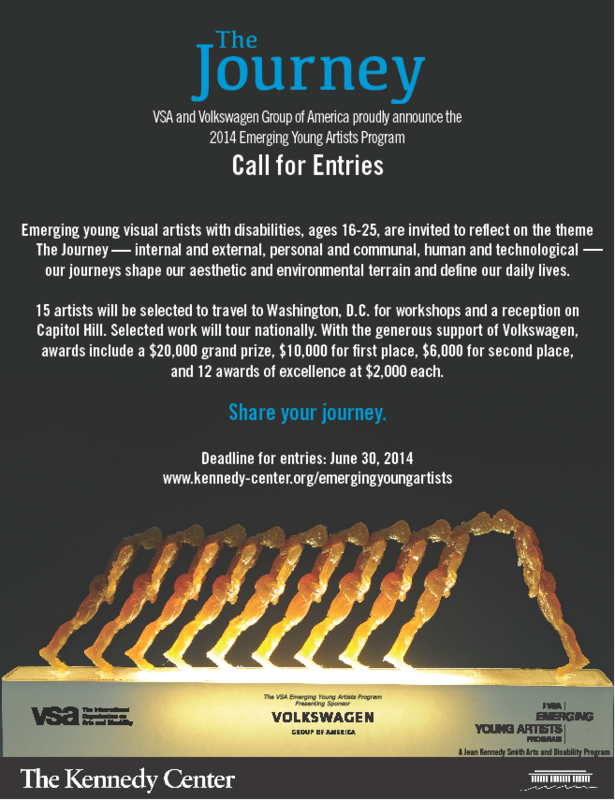 Rachel E. Nease, the Visual Arts Coordinator in the Office of VSA & Accessibility at the Kennedy Center in Washington, D.C., is reaching out to share information about the VSA Emerging Youth Artists Program. 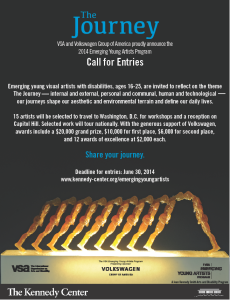 Visual artists with disabilities, ages 16-25, are invited to reflect on the theme, The Journey. Please see the attached graphic for more details on this year’s theme and our call for entry. The fifteen selected artists receive: a $20,000 grand prize, a $10,000 first prize award, a $6,000 second prize award, and twelve $2,000 awards of excellence. Winners are also awarded an all-expense paid trip to Washington, D.C., where they will participate in professional development seminars and attend a reception on Capitol Hill celebrating the artists’ involvement with the VSA Emerging Young Artists Program. The exhibition, The Journey, will open in Washington, D.C. at the Smithsonian Institution, then tour to venues nationwide. Our application deadline is June 30. Because many disabilities are invisible, we encourage you to share this opportunity with all students. As defined by the Americans with Disabilities Act, a disability is a physical or mental impairment that substantially limits one or more major life activities. Disability may be physical, mental, learning, or developmental. One of the programs past winners, Jansen Smith, attended Florida State University! Any questions and inquiries about the program should contact Rachael E. Nease at RENease@Kennedy-Center.org or 202-416-8823.